Fi-Glass Ski Angler is a fabulous design carrying up to five adults with a centre console and helm seat for maximum visibility cleverly doubling as cold storage. Versatility and value for money make the Ski Angler the perfect first boat for anyone after a skiing or fishing adventure with mates. At Fi-Glass Boats we understand that performance, safety and comfort are the keys to having fun on the water. With stylish design, stable handling and a capable power to weight ratio, the new Fireball is a versatile and affordable boat for the whole family. Constantly refined to ensure it remains one of the safest, driest and best performing family cuddies around. The Dominator is the ideal family boat performing in all conditions and delivering whenever the fun demands—skiing, fishing or diving. Seating configuration includes a single bucket seat, coupled with a back-to-back passenger seat. The cabin will stay dry with an external self-draining anchor locker. Family friendly and equipped for fishing, skiing and water adventures, the Firestar offers all-round boating versatility. At Fi-Glass Boats we understand that performance, safety and comfort are the keys to having fun on the water. 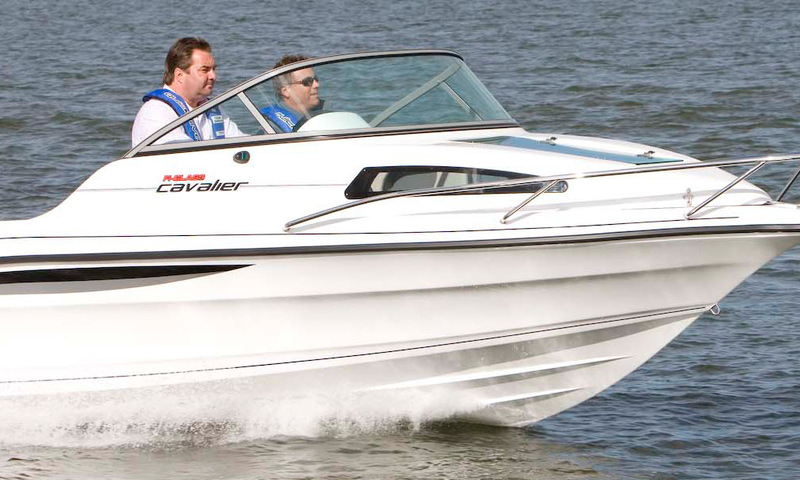 The Cavalier offers you the value, safety and flexibility while giving the best on-thewater experience whether you’re fishing, into watersports or just cruising. At Fi-Glass Boats we understand that performance, safety and comfort are the keys to having fun on the water. With a deep hull, a roomy layout and a comfortable, upholstered interior, the Lightning is great for fishing, watersports or just cruising. With outstanding versatility across all water conditions, whether fishing, water skiing or diving. The Warrior is the perfect choice for all your boating adventures. Options include inboard stern-drive, outboard motor and spacious hardtop models. Available as either outboard or stern drive version, the Warrior Hardtop comes standard with all of the superb features you would expect plus an array of hardtop specific features; including hydraulic steering, trim tabs and a canvas cockpit backdrop.